For anyone who missed LEGO Batman 2, Warner Bros. and Traveller's Tales will adapt its cutscenes for a direct-to-video release. If you've played any recent iterations of Traveller's Tales LEGO videogames, you may have noticed a change in its mode of storytelling. For example, where LEGO Batman relied entirely on non-verbal methods to communicate with players, LEGO Batman 2 switched to scripted dialogue and voice acting to tell an original superhero story. Both methods have creative merit, but it turns out that LEGO Batman 2's cinematic approach wasn't coincidental. Warner Bros. is actually adapting the game's storyline and cutscenes for a direct-to-video film titled LEGO Batman: The Movie - DC Super Heroes Unite, with a planned release on May 21st. "The movie was conceived before anything else," director Jon Burton explained in a previous interview. "We wrote the story for the movie and then did the video games. For [Christopher Nolan's] Batman, the movies got so dark that we wanted to make our own movie that would be as broad-based as it could be, including elements that we thought everyone would be familiar with." 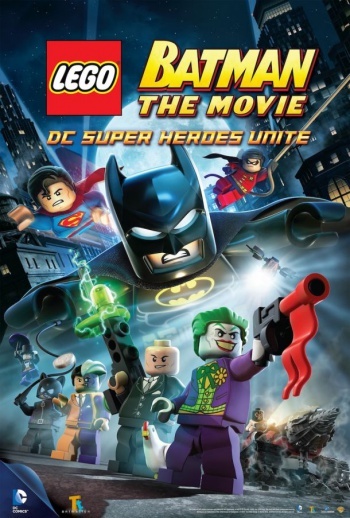 As much as I loved the LEGO Batman games, I'll admit to being a little reluctant about this particular film. LEGO Batman 2's cutscenes, which the movie reportedly uses heavily, have a total runtime of 51 minutes while the finished movie advertises just over 70. Some readers may remember a very similar proposal igniting a small firestorm back when Activision suggested it, so it's hard to speak confidently about the movie's prospects. On the other hand, I'm also the kind of person who doesn't see the appeal in Let's Play videos, and those are insanely popular. If marketed effectively, it's very possible this project will be a success. LEGO Batman: The Movie will be available via DVD, Blu-Ray Combo Pack, On Demand, and Digital Download. Initial Blu-Ray Pack purchases will also include Clark Kent/Superman LEGO action figures while supplies last.